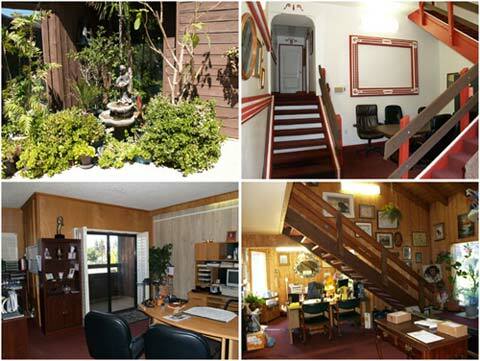 $295.00 Unique Office Space for Rent near Los Angeles, Ca. “In our 32 years of operations we have never raised the rent. We charge the same today as 32 years ago. Our Unique Offices are located next door to the Metropolitan City of Los Angeles. In the bedroom community of Lakewood, we are across the street from the Lakewood Shopping Mall. Los Angeles is the large city North of Lakewood, approximately 20 miles to downtown L.A. We are located between 4 major freeways. We specialize in small inexpensive offices from $295.00 with 2-room suites at $495.00 per month. Everything is month to month. We have over 100 offices and no two are alike. Our building and offices look like log cabins in the mountains. Our courtyard is lushly landscaped in plants, trees and flowers. Lakewood is a very safe city with little crime. “In our 30 plus years of operations we have never raised the rent.